The new order stands at Wil station whilst on test during May 1938, with the recently outshopped double locomotive making an impressive sight. As constructed the two halves were generally identical but could not operate as individual units due to the absence of drawgear and buffers on the inner ends. With the intent to purchase more of this type it was considered important that interchangeability of the separate halves be maintained as far as possible. Unfortunately the arrival of World War II rearranged any plans for further orders. There are many railway lines in the world which present some sort of challenge in running trains over them. For the Caile Ferate Romane (CFR) the well used line between Campina & Brassov presented a multitude of operating challenges. It was heavily used by domestic traffic and carried substantial longer distance international traffic between Bucharest and central Europe. The 75km (44 miles) between Campina and Brassov crossed the Transylvanian Alps (a part of the lengthy Carpathian moutain range) on gradients varying between 1 in 40 & 1 in 50 with uncompensated curves of 900 feet radius. In particular the route north of the summit from Predeal to Timisul De Sus contained many curves. In the days of steam operation two steam locomotives were required at the head of the train and either one or two bankers at the rear, a costly operation in terms of manpower and equipment. Plans to double track the route, electrify the route or modernise alternate routes were all stifled by the costs involved, leaving the possibility of dieselisation as the only alternate available to improve the working of the route. Specifications called for unassisted operation of 600 ton trains over the mountainous route, with the ability to restart a train on the steepest grade. This suggested an engine output of at least 4,000hp which, coupled to a 20 ton axle loading and eight driving axles meant building a locomotive of two parts to meet all the requirements. There was an interval of about two years between the placing of the contract and the delivery of the double locomotive to the CFR just prior to the start of World War Two. 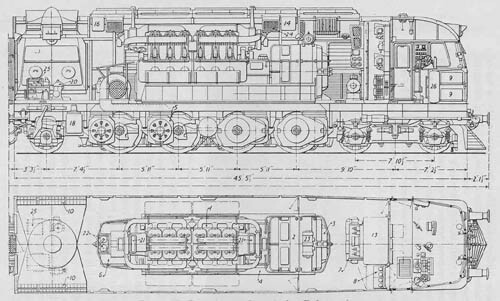 The finished locomotive had a 2-Do-1 + 1-Do2 wheel arrangement and was powered by two 2,200hp Sulzer engines similar to those fitted in the French PLM double locomotive. It had a maximum speed of 62mph, a maximum tractive effort of 81,500lb and weighed 230 tons loaded, 218 tons empty. The axle loading was 19 tons. Each 2,200hp engine, designated 12LDA31, had two vertical banks of six cylinders, each with its own crankshaft, which drove a single main generator through spur/step-up gears. The cylinder size was 310mm by 390mm (12.2in by 15.4in) which, with the use of the two Buchi superchargers provided a one hour rated output of 2,200hp at 700rpm. Under test a peak of 2,500hp had been attained for at least two hours without difficulty. The crankcase and cylinder block for the whole engine is in four parts, of cast steel; the cylinder block portion is in two halves, each containing six cylinders (three in each bank), and welded on the transverse centre line to its partner. The crankcase is in two corresponding halves welded together, the cylinder blocks and crankcase portions are bolted to each other. The engine measures 13ft 9in long, 6ft 3in high above the crankcase center line and 3ft 8in below, and 6ft 5in wide. The empty weight of the engine, including step-up gears and main generator was 21 tons (21.5lb per bhp), with the welded steel underfame added the weight increased to 23 tons. 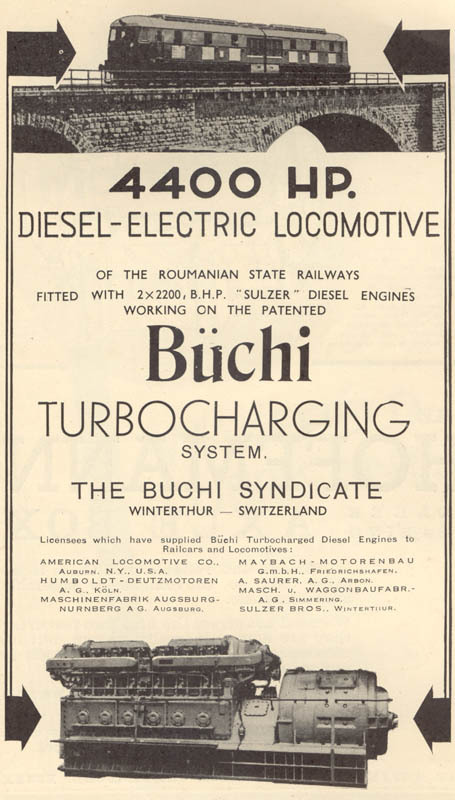 An advertisement from a 1938 railway journal features the Roumanian locomotive in an advertisement for the Buchi turbocharger. The starting tractive effort for the locomotive was 81,500lb, when operating at the maximum speed of 62 mph and under full power 21,500lb tractive effort was available at the wheel rims which was sufficient to haul a 600 ton train up a straight 1 in 200 grade. For the toughest section of the line the locomotive's output was more that sufficient to maintain 19.5mph with a 600 ton train. The one hour tractive effort rating at the wheel rims was 53,800lb at 20.8mph and 38,400lb at 29.8mph. Henschel & Sohn AG, Kassel built the mechanical portion of the locomotive, it was then moved on its own wheels to the Brown Boveri & Co. workshops at Munchenstein (Basle) for the installation of the power and transmission equipment prior to testing in Switzerland between Winterthur & St Gallen. From Winterthur it is 57.5km to St Gallen, mostly up hill with ruling grades of 1 in 100 & 1 in 125, the steepest grade being 1 in 83 for 3km between Gruze & Raterschen. With a trailing load of 300 tons the 57.5km was completed in 45 minutes, which included certain slacks and a top speed of 62 mph. It was not necessary to use full power for these numbers, with straightline acceleration being maintained to about 70kmph. 1,800 amp / 1,200 amp at 430 volts on notch four. A manufacturer's view of the prototype 2-Do-1 + 1-Do2 locomotive. 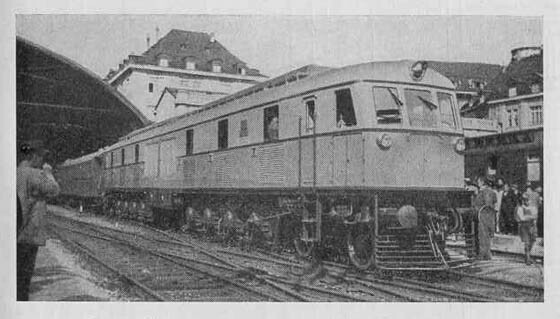 Internally the locomotive was similar to the French PLM operated Sulzer powered locomotive, but externally the Roumanian machine seems to bear a little of the Swiss influence, unlike the two very stylised French machines. The locomotive was not equipped with any train heating equipment, in cold weather the CFR would allocate a steam heating wagon for passenger trains worked by this locomotive. 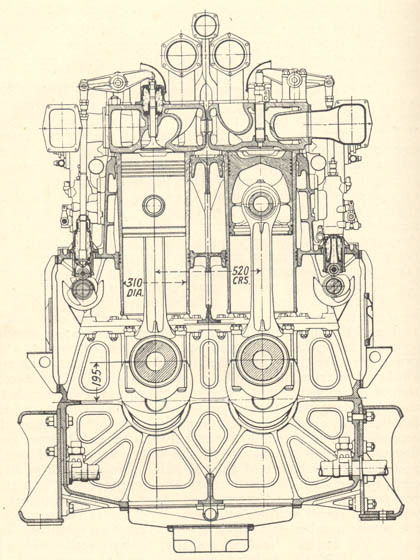 A cross section through the 2,200hp 'double bank' engine. The main contractor was Sulzer Brothers, Winterthur, mechanical parts by Henschel (b/n 23549 of 1938), electrical parts and engine assembly by Brown Boveri & Co. After construction the locomotives trialled between Winterthur & St Gallen in May 1938, running up about 1,100 miles under test. The double locomotive was handed over to the CFR on June 16th 1938, with comprehensive tests commencing on July 5th 1938 over the route which they had been designed for. The testing was so successful that after only eight days they were accepted by the railway authorities and introduced into regular service on July 20th 1938. In the early days the locomotive was stopped for one day a week for inspection and the ability to make minor repairs if necessary. By the end of August 1938 the double locomotive had run 9,500 in service for the CFR. During World War II the double locomotive was stationed at Grivita Works. When the railway station and workshops were bombed during 1944 the local power supply was disrupted. One of the double locomotives was used as an emergency power supply. From 1946 - 1963 they were allocated to Brasov, being withdrawn from there in 1963. 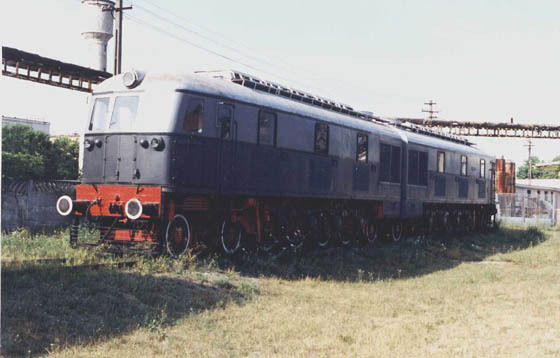 They were placed on display at Bucuresti Calatori depot, later restored in 1994. During 1996 they were moved to Dej Triage depot. The survival of the twin unit 1938 built 'demonstrator' has to be one of the more charmed stories in the preservation of pre-World War Two diesel locomotives, perhaps just surviving the conflict is remarkable in itself. (Two large views of this machine can be found on the Roumanian page of the European Railway Server). From publicity material comes this interesting view of the CFR Roumanian double unit diesel under test on the Winterthur - St Gallen line, crossing the Sitter viaduct. Despite this being a substantial structure it was dwarfed by the nearby bridge built for the Bodensee - Toggenburg railway, found half a mile up river. Elswehere on the Sitter other substantial bridges carried the St. Gallen - Appenzell & the Sulgen - Gossau lines across the river. Another publicity view, this time for Buchi turbochargers features the double unit, presumably on test in Switzerland, location not known at this time. Page updated August 12th 2010.